1 pound (about 5 – 6 links) parsely and cheese chicken sausage or whatever kind you prefer. Remove chicken sausage from casings. In a medium pan, cook sausages until no longer pink. As they cook break sausages up, with a spatula, into small to medium size pieces. If needed, drain slightly, and then divide sausage crumbles among 12 muffins tins sprayed with cooking spray. In a large bowl, whisk together eggs and milk. Add a little salt and pepper if using. **Please note I think the sausages add enough flavor without the salt and pepper. Next time I make it I will probably leave the salt and pepper out. 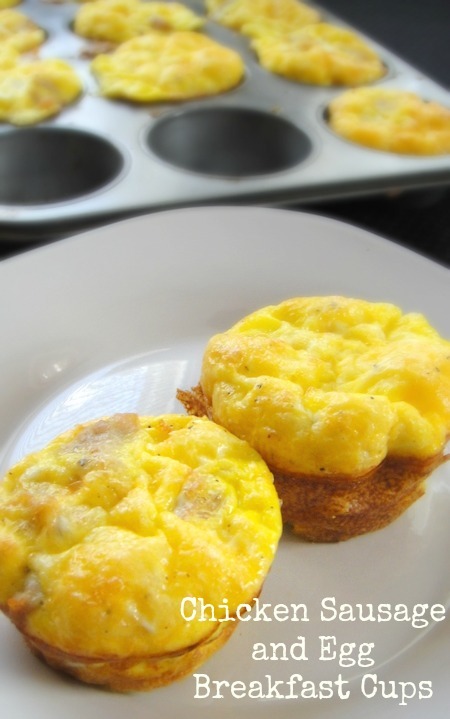 ** Divide the egg mixture evenly over the chicken sausage in the 12 muffin cups. Sprinkle cheese evenly over muffin cups. Carefully walk to place the muffin pan into the oven and cook for 20 – 23 minutes or until cooked completely. Serve immediately or refrigerate.
" Prep time 10 mins " " Cook time 23 mins " " Total time 33 mins "